Please refer to our stock # 3497 when inquiring. 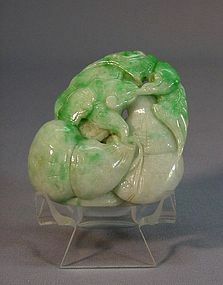 This unusual jade (jadeite) pendant is 2 ¼” long, 2” wide (measured from the widest part) and 5/8” thick (measured from the thickest part). It is a late 19th or early 20th century product. It is carved on both sides as two double gourds (葫蘆) resting against each other. A twisted RuYi (如意) scepter with LingZhi (靈芝) ends and a branch of flower blossom are leaning over them. A small crane is on the top of one of the gourds. The carving is delicate and interesting. It is in excellent condition.